The Art of Golf is a strange title really for someone like me to write about as I must confess that at golf I am hopeless, lol but I do have a lot of fun anyway. 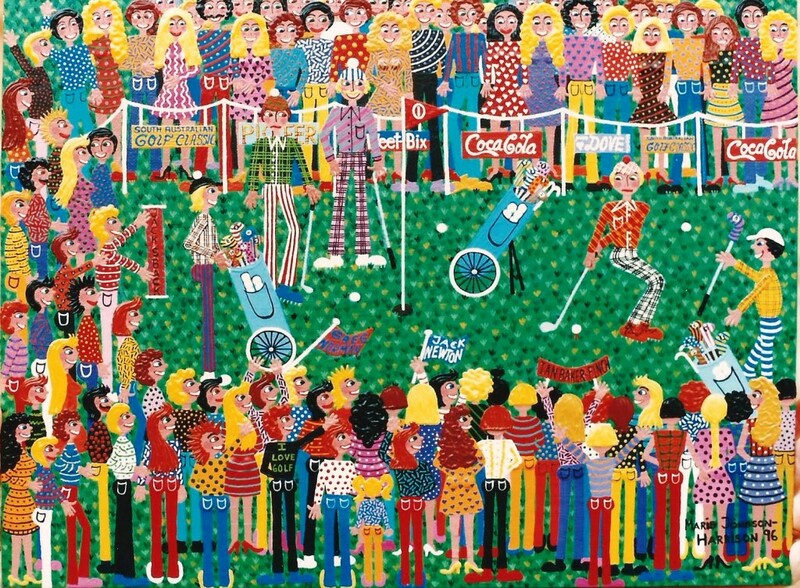 Perhaps even more fun than actually playing the game was painting golfers in this naive artwork in acrylic on canvas board of some golfers who perhaps unlike me know what they are doing. My experience with golf is very limited to a few rounds in my teenage years with my dad and then recently with our son Kai and his girlfriend Samantha. My husband and I in anticipation of the planned golf day even got ourselves a set of clubs, second hand from a market but they seemed in good nick and were bought for a song! So the golf day arrived and we even had a motorized buggy for the 18 hole golf (Par 5) course and our teachers were Kai (who had played quite a bit in his high school years) and Samantha. What probably should have taken them a few hours to get around the golf link took nearly the whole day as I managed to hit the balls in every direction with ducks flying for cover that was, if I even managed to hit the balls at all. On top of this my son points out time and time again trying to hold his frustration in check; “that golfers do not follow through with their legs and do a high kick like a can-can dancer at the end of every golf stroke”. And neither do they follow through with their tongues outside the mouth, so it is obvious that I still have a lot to learn! Who knew! And there I was thinking I was starting to show some good form. Luckily we had our lunch packed so there was a highlight to the day, and eating is something that I am good at! Our second attempt went a little better; no change in either the leg or tongue but this time the course were only Par 3 with a shorter 18 holes and no ducks for me to maim either which Greenpeace will be happy about. 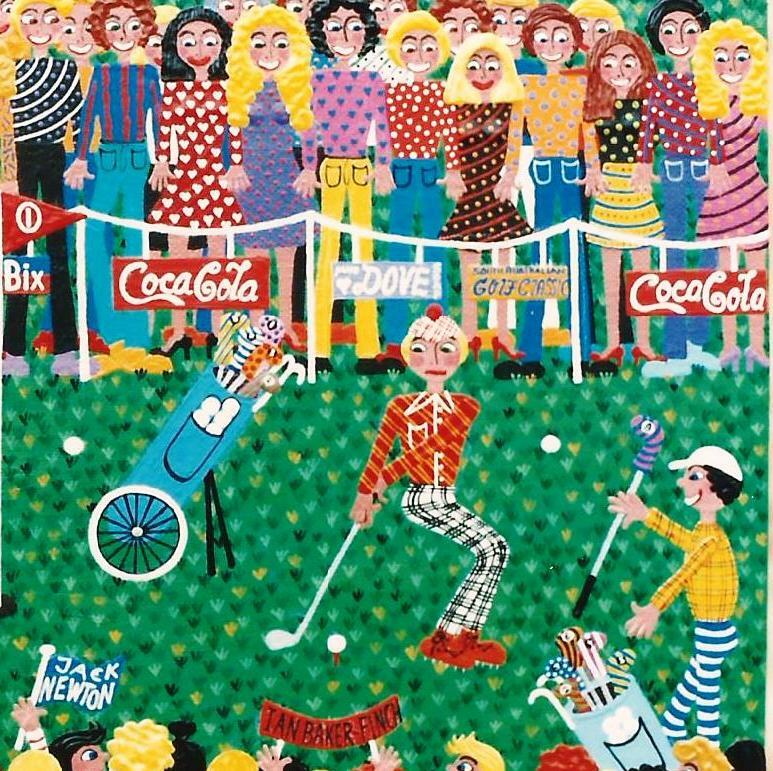 My only other connection to Golf was in my modelling days when I was just starting out and had a couple of days on the golf course during a televised tournament with the golf stars of the day. I guess the job would be better described as a promotional one and my brief had been to try to get as much air time as possible wearing a T-shirt with the “brands” logo on it and shorts. Long time ago now so I don’t remember what I was advertising but I do know that I they were very pleased with my efforts as I turned up quite frequently on the TV. Seems to me I should have concentrated a little more on the game and perhaps then I could have learned a trick or two from the overseas golf stars that were here that time. “It is more satisfying to be a bad player at golf. The worse you play, the better you remember the occasional good shot”. Till next time happy painting and sculpting and perhaps golfing.